Blogspot has inbuilt traffic analytics tool called Blogger Stats which helps users to check and analyze the daily traffic to their blogs. It shows leading blog posts which attract more traffic with the most successful traffic generating keywords. Though blogger Stats cannot match with Google analytics, it is enough for an average user to analyze the daily traffic to his blog. With the help of the necessary details supplied by this tool (major traffic sources and keywords which bring traffic), the user can optimize his blog. This tutorial explains how to use this feature to fetch visitor details and the difference between visitor count shows by this feature and Google analytics. It is not hard to access blogger stats. When you log in to your Blogspot account, you will see the summary of traffic to your blog provided by it. Look at the image below to understand it more. To get a detailed report from Blogger stats, you must click on the Stats link from the control panel menu. It is one of the most confusing questions faced by most of the newbie bloggers who don't understand the working of these two tools. 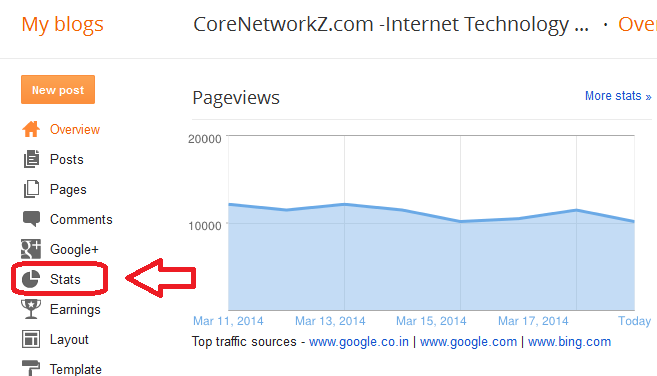 Blogger Stats always shows more traffic than Google Analytics and it is enough for a normal user to get confused. Which one shows the right visitor count? It is the Google Analytics which is more accurate because it does not count visits by bots. There are so many bots crawl our websites every day like Google bots, MSN bots etc. Google Analytics is smart enough to identify these bots by checking their behavior and exclude them from page views report. So Google analytics shows less number of page impression. It always lists the real visits compared to the traffic chart created by Blogger Stats. Here you can see the major differences between these two tools. It is not just a table of differences between these two tools but a list of important features too. Both tools work in different ways and it influences their results too. Still, some users use a classic template for their blog because of their own reasons. If you belong to one of those, you can open blogger stats after enabling this feature by following the steps below. Now on the dashboard, you can see the following menu. After enabling the blogger stats, you will see an additional tab. Now let us check how to enable this feature in the classic template. After this, you can see one more tab in top tabs - Stats. Click Stats link to start blogger start. Though this built-in tool is very much helpful to analyze a blog's performance, I still recommend using Google Analytics. It is because Google analytics is feature rich compared to other tools. However, if you do not want to add any scripts to your blog, former is enough. However, major advertising companies count the page views reported by Google analytics only. They do not count the page views report generated by blog post. Even if you check your AdSense report page, the page impressions listed in the report matches with Google analytics.